It is hard to believe, but it has been more than 30 years since I first introduced our Essential Omega-3 back in the 1980s. 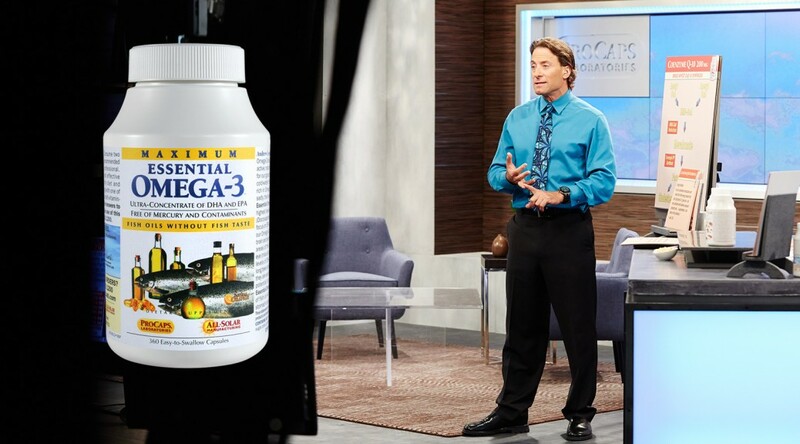 Even more difficult for me to believe is the fact that it has been almost two decades since we did our first Essential Omega-3 Today’s Special at HSN. Time truly does fly! If you have enjoyed this formula over all those years, then you have observed the consistent improvements we have made to its quality, potency and value. What is most exciting to me is that when I first introduced the formula we were singularly focused on heart health, and those of us enjoying its benefits had no idea that the next few decades of scientific research would go on to demonstrate benefits to eyesight, brain function, emotional health, bone health and more. It reminds me of what I often say when contrasting a sensible approach to vitamins to that of taking drugs. With drugs, we hope they do what they need to do with the least damage and the fewest side effects possible. With a sensible approach to essential nutritional supplements, we do not expect to cure a disease, but to fill a known nutritional gap and, because of the way the human body works, when we fill that gap, we get to enjoy wide-ranging “side benefits” and NO side effects at all. Despite aggressive claims by many promoting Omega-3 fat, these essential fatty acids are not drugs that treat or prevent heart disease, age-related macular degeneration, senile dementia, Alzheimer’s disease, Depression, etc. That is unfair and very misleading to say. Correspondingly, we do not view Calcium and Vitamin D as a cure for osteoporosis, but what they are, without question, is the structural and functional ingredients our body requires to build and maintain healthy bones. Omega-3 Fatty Acids are an essential structural and functional component of the most vital organs and systems in our body and, to the extent they are unavailable from our diet, it is incumbent upon us to ensure that our brain, eyes and cardiovascular system have a steady supply. We are not treating a disease but, for instance, in the case of our brain, we provide the Omega-3 Fatty Acid DHA because it makes up the majority of the dry weight of our brain. Moreover, in terms of our eyes, the highest concentration of DHA in the human body is found in our retina and its macular region. We might not think of our brains and eyes as being fatty structures, but they absolutely are and they rely on an abundance of the Omega-3 Fatty Acid DHA to maintain their healthy structure and function. This only scratches the surface of the vital role these essential fatty acids play in our bodies and I will elaborate further on my shows tomorrow night and Sunday. So here we are some 30+ years later and those of us who were wise enough to enjoy the benefits of our Essential Omega-3s for heart health “back in the day” are now being rewarded with the knowledge that, for decades, we have also been nourishing our most vital systems throughout our bodies including our brain, eyes, bones and even the healthy radiance of our hair, skin and nails. The science is compelling and easy to find online or at the National Research Database at PubMed.gov. You can just type in “Omega 3” followed by words relating to almost any body system, organ or health issue (e.g., cancer, eye, brain, dementia, depression, heart, liver, breast, prostate, bone, etc.) and you will find a fascinating abundance of research. As I always say, the more you know, the healthier you will be. Again, this is not to view Omega-3s as a cure, treatment or prevention for disease, but simply acknowledging their inescapable structural and functional role in the human body. If one considers the vital structural and functional role of these essential fats against their insufficiency and deficiency in our diet, we are left with the inescapable conclusion that we must either dramatically change our diet or take a supplement. Experience has taught me how difficult it is to make even small changes in our diets, so clearly the 5 seconds necessary to take a capsule that costs pennies a day is the most practical solution to this major health problem. That would seem like a simple solution if all Omega-3s were made like ours but, sadly, most are distasteful products that are large, hard-to-swallow capsules that cause upset stomachs, nausea, fishy aftertaste and fishy repeats. In other words, most Omega-3 supplements are not a desirable solution to replace the Omega-3s we lack from our diet and therefore are not consistently used. It pleases me that decades after the introduction of our first Essential Omega-3 formula, our capsules today are even smaller and more gentle, yet higher potency and surprisingly more affordable. How many products provide greater benefits today than they did a few decades ago? And are also less expensive?! Although I am very proud of the 4.7 Star Rating and thousands of 5-Star Reviews that our Maximum Essential Omega-3 has received, I remain most enthusiastic about the constant evolution of the science. In a few decades, Omega-3s have gone from being a heart-health supplement to an absolutely essential and foundational ingredient for brain and eye health – not to mention bone health, mental function, mental outlook and beauty. In looking at the science, I would have to say that as much as we have continuously improved our Maximum Essential Omega-3 over the decades, the Research and Science has also independently improved. Most importantly, our product is even easier-to-swallow, gentler and more affordable than ever before. I look forward to talking more about the history, evolution and benefits of Omega-3s in light of all the latest science. The abundant research makes it one of the most enjoyable ingredients for me to discuss. Also, I am not aware of any other companies that have so passionately advocated Omega-3s for as long as we have nor made a product that delivers all the benefits as trouble-free as our Essential Omega-3. See you tomorrow at 11 PM Eastern Time (Saturday night), then we will formally kickoff the Today’s Special at midnight and continue throughout the day on Sunday. Also, since so many folks go to bed before midnight (as I normally do), I have once again made a home video (with Link) that provides a sneak peek at the Today’s Special airing at 8 PM Eastern Time on HSN. The video will also be available on HSN.com until midnight. Of course, our Today’s Special and all our products will come with FREE Shipping and Handling throughout the weekend, and our Today’s Special will be at its best pricing of this year…or any year for that matter. Enjoy! 31 thoughts on “ Maximum Essential Omega-3. I take MANY Andrew Lessman products, all of which have improved my health and well being! I recommend his supplements all the time. I ALWAYS look forward to his Todays Specials so I can restock my supply until the next TS comes along. EVERYONE should at least try his supplements for themselves to see and feel the difference for themselves. I not only see and feel the difference myself, my lab reports before using his supplements compared to after using his supplements is absolutely and completely mind blowing (for the better!!!). Thanks Andrew for all you do and for bringing your amazingly pure supplements to us! God Bless you and please NEVER STOP! PS: PLEASE make a super large size (BIGGER than 360 count) of your iron plus product-at least once or twice a year would be such a blessing!! Does this fish oil or maximum fish oil have the 3 5 6 7 9 supplement? please let me know just before you are going to have Coenzyme Q-10 200mg,so I will have the money saved for it. I really love this product,and I miss it.I intend not to let it run out again. THANK YOU ANDREW for all your great products. Theresa, coq10 Today’s Special is usually on October TS. I love Andrew’s omega 3 products. Our family has been using it for about 3 years now. And now we are about to run out. As of always, we will be getting the biggest jar possible. See you tomorrow night. My Husband is on medicine for his cognitive and memory. I did not get to see HSN. when you were on . Is this product Omega 3, helpful Dr says he is on beginning stage of Alzheimer. Please help me .I really want to give him healthy Supplements to help him recover and beat this illness. He will be on this coming weekend, Alice, you haven’t missed him! I don’t think his company responds here, so others here will tell you to call his company’s phone number (800-800-1200). They will give you some information, but I don’t believe they can recommend anything. It is recommended to talk with your physician regarding supplements. I recommend researching online as well. There is always new information coming (you might find it overwhelming?!). Look into healthy eating (i.e. NO SUGAR, LESS SALT, LESS RED MEAT, LESS DAIRY, FEWER FRIED FOODS). Read up on supplements and use that information in buying from Andrew. So to start, I’d call up his company and go from there. Hoping for the best for you and your husband in this new stage. Read all you can!!!!! I am so sorry to hear about your husband’s condition. Andrew is always very up front about not making “false claims” about any of his products because I believe he used to be a lawyer for the food industry somehow ? I’m not too sure about that last statement, but you can’t honestly say, “Hey, take this and it’ll cure that.” Supplements are made to help us, but they effect us each differently as individuals because of our diets, meds, genetics, prior conditions, etc., etc. Taking that into consideration, research has shown that a lot of the supplements that Andrew makes and distributes, do have a very positive effect on most of us. One of the hardest parts is taking something consistently. If you have a deficiency in something, these supplements won’t work over night. You have to take them for a while and keep taking them to reap the full benefit. When Andrew is on HSN, that is the best time to buy because all of his products are on sale and they all come with free shipping :o) ! You can buy through HSN or you can buy from Andrew’s website at procapslabs.com. The reduced pricing and free shipping is in effect at both places at the same time. The only benefit through shopping through HSN is that they offer “flex pay,” which just basically means you can pay in payments with no interest :o) ! You can also contact procapslabs directly over the phone for their customer service at 1-800-800-1200. Their customer service representatives are all extremely helpful, and if they don’t have an answer about something for you, they put you on hold till they find someone with an answer :o) ! These all help with the brain’s function. Vitamin D3 is also very important and is included in some of the products I mentioned, but your husband might need to take an additional supplement of just Vitamin D3 if he is deficient in that. I hope that helps :o) ?! God Bless You and Good Luck with Your Husband ! That will be his Today’s Special next weekend as far as I know. Cheers :o) ! I currently take a supplement from another manufacturer called essential fatty acid complex. EFAC. I would love to see you introduce a ProCaps Version of this product so that I can purchase it from you. EFAC has worked miraculously in relieving pain in my joints from arthritis. It works better than any other joint formula I have ever taken in my life. Please consider coming out with this product as I know it would be enormously successful. Thank you very much. I really like all Andrews products.. I like the urgent energy as it doesn’t make me jittery. Also great results with artery and vein control.. I’ve had great results with anything of Andrews I take regularly.Itrust his vitamins .I am guessed at 55-60 always and I’m 81.. Please please offer a TS on prenatal vitamins. I have four daughters who need to start taking this as they will be growing their families soon. I purchase for all my family members so I am thrilled when I can purchases the finest supplements available at great prices. Please keep us the great work, what a wonderful mission you have in your life. Thank you for sharing your knowledge and talents with us. May God bless you in all your righteous endeavors. To health and happiness!!! is your Omega 3 different than Krill Oil? Andrew, my daughter is 36 yrs old, mentally handicap, I give her cranberry, cinnamon, fibermucil and essential. I have to open the capsules and put in her applesauce for her to take(it hard for her to swallow pills). I want to add omega. Can I open the omega capsules ? I would like you to comment on how to take your supplements. I take many of them and wonder if they can all be taken together or are some better taken with others, on an empty stomach or with food. So why is an excess of DHA detrimental and an excess of EPA useful? DHA has a larger structure with two extra carbons and two extra double bonds, so it literally takes up more space in cell membranes than EPA. On the one hand, this is important because DHA plays a structural role in maintaining the fluidity of cell membranes ( essential for the normal function of proteins, channels and receptors that are also embedded in the membrane), but if a cell membrane becomes too saturated with DHA it can become too fluid, which can have a negative effect on cell function. EPA, on the other hand, is constantly utilized and always in demand. Please make your Omega 3 Fish Oil Super Size TS. I need at least a 730 ct so I have enough to take 2 per day until your next years visit. LOL!!! Will you ever offer a vegetarian Omega 3 product? does anyone know what products go on sale/special what time of the year or when andrew in on tv? Like the m=omegas are on special in april then again next april.. There have been a number of studies that have directly compared the absorption or bioavailability of ethyl ester and triglyceride oils. Although a small number of these studies have found that absorption is similar between triglyceride and ethyl ester oils [9, 17], the majority of research supports significantly increased absorption and bioavailability of EPA and DHA from triglycerides. Natural triglyceride fish oil supplements offer numerous advantages over ethyl ester fish oil supplements. First, triglyceride oils are the molecular form found naturally in fish, and they are more resistant to oxidation than ethyl ester oils. Most important, however, is the fact that triglyceride fish oils are metabolized and absorbed more efficiently and completely than ethyl ester oils, which may increase overall health benefits for consumers. Everything you talked about tonight is so true… not that I didn’t believe you, but it was so cool to see that others do too. I will ALWAYS buy my supplements from you. NO one educates us better than you do… Thank you and God Bless You. Steve, according to all the years of watching and shopping for Andrew’s products, the following are what I have learned. He usually comes to HSN 4 times a year. January, April, July, and October, those are consistent months. In between those, he may be doing 1 weekend visit, for example, this February, he did a Today’s Special on his “Essential 1”. For January, he would do his meal replacement. April, Omega 3 and Ultimate Eye. July, Healthy Hair Skin and Nail (H.S.N.). July may be harder to predict, besides the Hair Skin Nail, he may also do other products. October, Coq10. For the last couple years, he has also provided the “Survival Kit”, an array of about 18 different products (I believe) at “try me” sizes (most of them are 60 capsules per bottle) at around Xmas time. Hope that would help. Will you ever offer your Multivitamin – Men’s Elite-100™ with Maximum Essential Omega-3 1,000 mg on HSN? Mainly looking for a discount that usually occurs when HSN carries a product. It also helps only having to take one product compared to a dozen per day. Andrew, I would just like to thank you for all of your vitamins and the extensive research you do before you present them to the public. It is obvious that this is not just a job for you, it is a passion. These vitamins and the research help so many people. My 28 year old daughter has Acute Myeloid Leukemia and we were told she had about a year to live. They wanted to start her on Chemotherapy right away but she refused knowing that Chemo usually only works 2% of the time. Even when it works, more often than not, the cancer usually returns again and then it is more aggressive. Believing that the body can heal itself with nutritional support that it is lacking when sick, we decided to change her diet by juicing mostly the green veggies, (plus beets) and keeping the solid food more on the ketogenic side. We then supplement with quite a few of your vitamins. Your vitamins do not upset her stomach and though she has good and bad days, she is still here 2 years later. I believe with all of my heart that she would not be here if she had not had the vitamin supplementation and had gone with the chemotherapy. We also have a strong faith in God! I have only seen chemo weaken the immune system and usually the effects of it kill before the cancer itself. * However, I am not trying to push our decisions on anyone else, everyone must decide what is right for them*. My daughter is a beautiful girl and though not cured (yet!) I am an optimist… :)…. she is living a normal life doing most everything she wants to do. She has glorious waist length hair, too, which is a surprise to most doctors being that she has leukemia and she doesn’t look sickly. One of her doctors was so impressed with her lab work and physical appearance, that he even ordered some of your vitamins for his office as a option for his patients, in tandem with their regular care plan. My whole family now takes many of your vitamins and I can tell you that your wellness products are the only ones that I completely trust. I also love that you give an internet site to research any ingredient going into a product. My daughter also has rheumatoid arthritis and I was so excited to see that you had added turmeric to your product line! I always check your website for new products and the Todays Special Value when your schedule permits you to be on HSN. I just wanted you to know how much you have meant to my whole family and to thank you for your help in keeping us all healthy! Andrew. I absolutely believe in your products and love them so much. I am taking quite a lot of various Andrew Lessman products. Needless to say I am in greatest health. I thank you ! Please don’t stop what you are doing. Love that you are on HSN. The one thing I really am anxious for is for some type of education, by you Andrew, as to how and when each of these supplements should be taken and can they be taken together. Perhaps when doing a show about specific supplement you could educate on proper way and time to take each. That is so needed. Please.